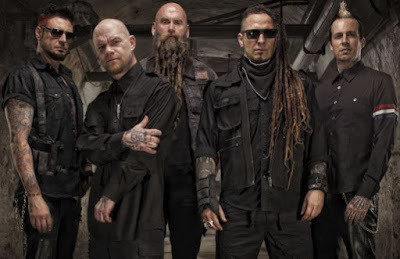 MetalRockNews: Five Finger Death Punch receive "Soldier Appreciation Award"
Five Finger Death Punch receive "Soldier Appreciation Award"
Five Finger Death Punch recently received the prestigious "Soldier Appreciation Award" from the Association of the United States Army. Guitarist Zoltan Bathory said: "The Soldiers Appreciation Award is something very special. The only musician ever to receive this was Elvis Presley. Clearly what we have to say resonates with a lot of veterans and a lot of service members. To know that we are reaching people and touching their lives with our music is very rewarding, and to me this really is the sole purpose of being a musician, to be able to make a positive impact in somebody’s life."